Doors set the mood for a space, and Moore Lumber & Ace Hardware has lots of choices. From patio doors to moving glass walls, Milgard and Weathershield have you covered. Beautiful steel or fiberglass entrance doors by Thermatru set the tone for entrances. Paint or stain grade interior doors by complete the design you are trying to accomplish. Read more. Bring the outside in with moving glass wall systems from Milgard available in custom sizes for retrofit and replacement patio doors. These large glass panels offer sweeping outdoor views, flooding the room with natural light and fresh air. Multi-slide doors from Weathershield create seamless indoor-outdoor movement and accommodate openings as large as 50′ wide and 10′ tall. Wood interior doors from Simpson and Buffelen set the mood for a space. Moore Lumber & Hardware offers a wide assortment of interior doors ranging from more common four- and six- panel doors of pine or fir to custom doors of alder, oak, or cherry. If you prefer painted doors, see our great selection of Jeld-Wen doors. Make a welcoming impression to your home with an entry door from Moore Lumber & Hardware. We offer exterior door systems made of wood, fiberglass, or steel in a number of styles from ThermaTru, Masonite, and Simpson. 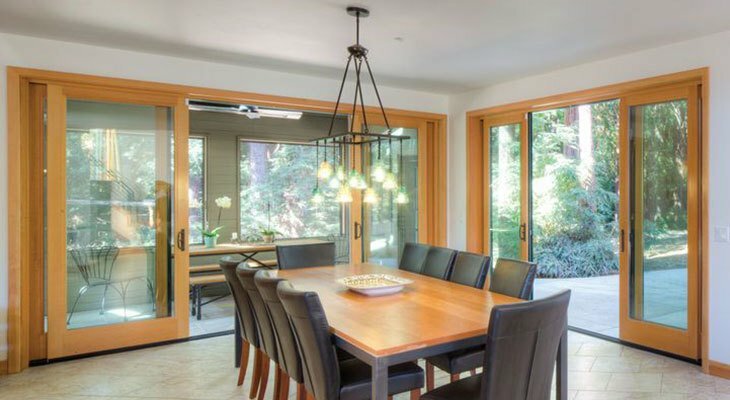 To add architectural details and natural light to your home, consider the multiple options we have for patio doors from Milgard and Weathershield, ranging from traditional sliding doors and French sliding ones to pocket moving glass walls. Come see us, you will love the choices.